U.S. President Donald Trump’s decision to impose tariffs on steel and aluminum imports has increased the distance between Washington and the Trans-Pacific Partnership free trade pact. Japan and the 10 other members remaining in the trade treaty signed the deal on Thursday without the United States, just a few hours before the U.S. president signed the new U.S. trade measures on metal imports. The 11 countries have left the door open for the world’s biggest economy to rejoin the pact, as Trump has suggested that is a possibility since pulling his country out of the deal last year. But his latest protectionist move only runs counter to the ideas of the trade initiative, formally renamed as the Comprehensive and Progressive Agreement for Trans-Pacific Partnership (CPTPP), analysts said. The United States’ high-handed measures are expected to continue, he added. Toshimitsu Motegi, Japan’s minister responsible for TPP, told a news conference in the Chilean capital Santiago that he has not given up seeking a U.S. return but said it is “extremely difficult” to renegotiate the terms of the pact. The original TPP accord, which included the United States, was supposed to cover 40 percent of the global economy — far bigger than the 13 percent that falls under the revamped agreement. The 11 members of the revised pact are Australia, Brunei, Canada, Chile, Japan, Malaysia, Mexico, New Zealand, Peru, Singapore and Vietnam. Analysts predict that ahead of November’s midterm elections, Trump will not stop pursuing unilateral measures to reduce trade deficits, even if they may violate global trade rules. Trump had already introduced safeguard measures against the import of large residential washing machines and solar panels in February, and the conclusions of investigations on China’s alleged theft of U.S. intellectual property are also pending. The power balance in the Trump administration has also shifted recently, with Gary Cohn — known as a proponent of free trade and an opponent of the latest policy on steel and aluminum tariffs — resigning as the president’s chief economic adviser. Peter Navarro, director of the White House National Trade Council and China hardliner, has been floated as a possible candidate to succeed Cohn. Even with Trump suggesting the U.S. could return to the TPP, “there is no change in President Trump’s trade policy that it will continue to make strong demands to meet its interests, whether bilaterally or multilaterally,” said Sugawara. The newly signed pact will go into effect 60 days after at least six countries complete domestic approval procedures. Japan, the biggest economy among the 11 members, hopes to become the first to complete the process, thereby building momentum for ratification. The government will submit related bills to the Diet later this month, seeking to gain approval to implement the agreement by this summer. The 11 countries said in their joint statement that they welcome more partners taking part in the deal. But the U.S. absence in the framework may limit the appeal to just a few countries, analysts said. For a country like Indonesia, TPP was attractive as long as it ensured access to the massive U.S. market. With the odds remaining high that the United States will not return to the deal, the TPP may not be a trade framework every country wants to pursue. But other nations may see TPP as a buffer to help mitigate forceful requests Washington may make on a bilateral basis, and also to deal with China, whose clout in the Asia-Pacific region is growing, they said. “Amid the growing Chinese influence in the Asia-Pacific region in not only economic spheres but (also) in security terms, joining the CPTPP could be significant as a countermeasure to China,” said Toru Nishihama, chief economist at Dai-ichi Life Research Institute. “Some countries may also want to use the CPTPP as a trump card” as the United States’ policy toward the Asia-Pacific region remains uncertain, Nishihama said. The following is a chronology of events related to the Trans-Pacific Partnership free trade negotiations. March 2010 — Eight countries, including the United States and Australia, start negotiations toward a multilateral free trade pact to be called the Trans-Pacific Partnership. July 2013 — Japan joins TPP talks as 12th member from the 18th round held in Malaysia. October 2015 — 12 TPP negotiating countries reach broad agreement at ministerial talks in Atlanta. February 2016 — 12 TPP countries sign agreement in New Zealand. December 2016 — Diet approves TPP. January 2017 — President Donald Trump is sworn into office, and later signs an executive order pulling U.S. out of TPP. March 2017 — Eleven remaining members hold ministerial talks in Vina del Mar, Chile, for first time since U.S. withdrawal. May — TPP ministers from 11 nations agree at meeting in Hanoi on preparatory work to put pact quickly into force. November — Eleven TPP ministers agree in principle on revised version of pact, renamed Comprehensive and Progressive Agreement for the Trans-Pacific Partnership, in Danang, Vietnam. January — Eleven TPP chief negotiators finalize negotiations on CPTPP at meeting in Tokyo. 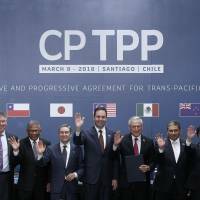 March 8 — CPTPP is signed in Santiago.